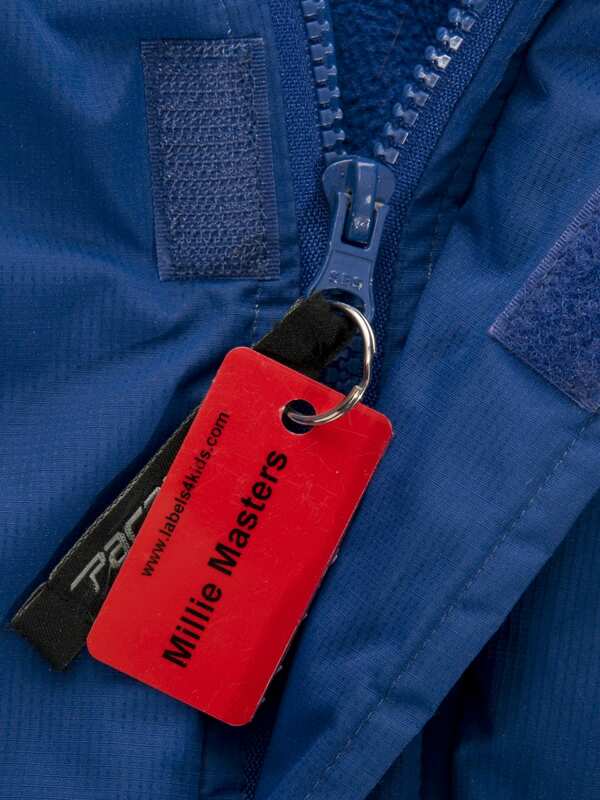 Personalised jacket tags keep your jacket safe with Labels4Kids. 3 Small tags that fit onto the zip of your jacket. Also great for key chains and key rings: 55mm long * 28mm wide with 3 key rings. 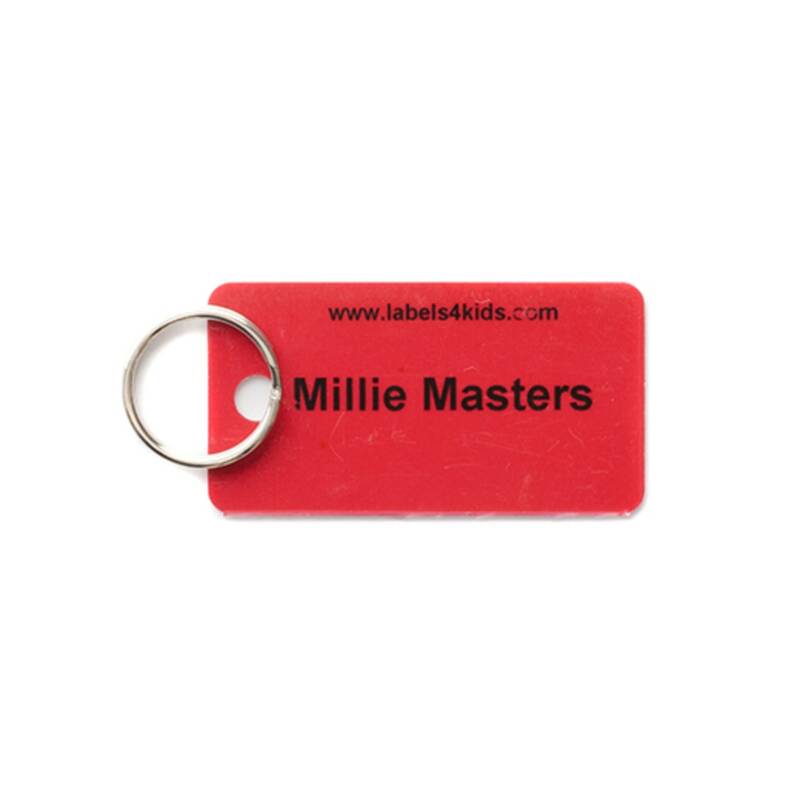 Check out also the personalised bag tags, ideal for school bags. Personalised jacket tags make great identity labels for coats. Durable, waterproof tags that can hang from pockets or zippers and great for reversible coats too. 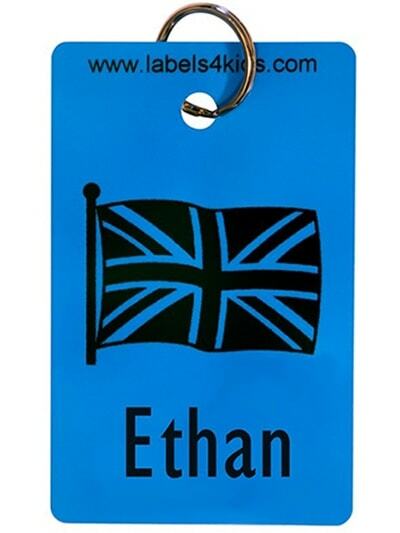 Labels4Kids personalised jacket tags come as 3 small tags that can be personalised to your request. 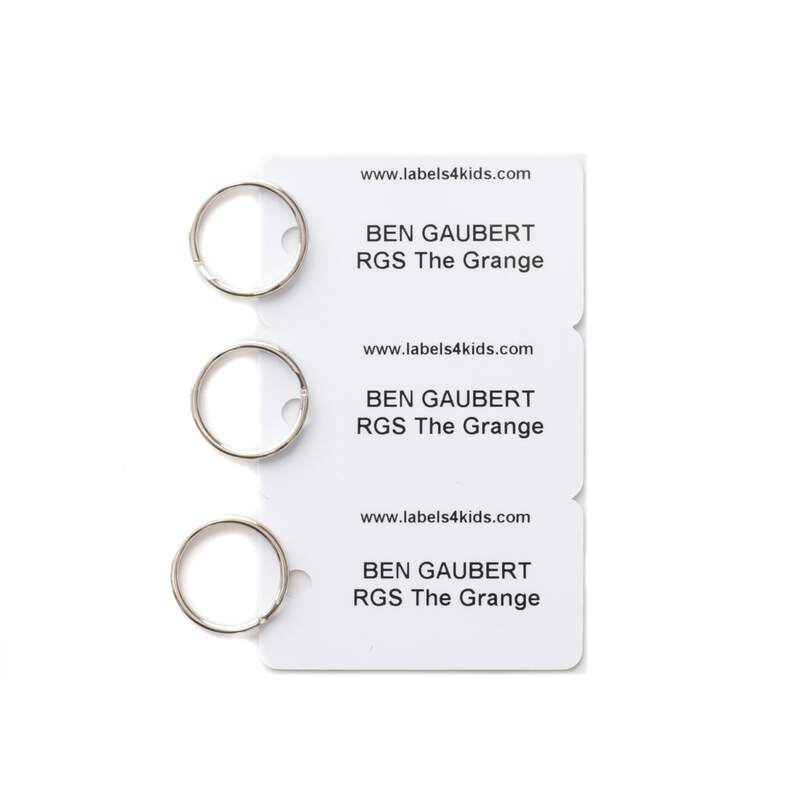 Split key rings included with name tags. 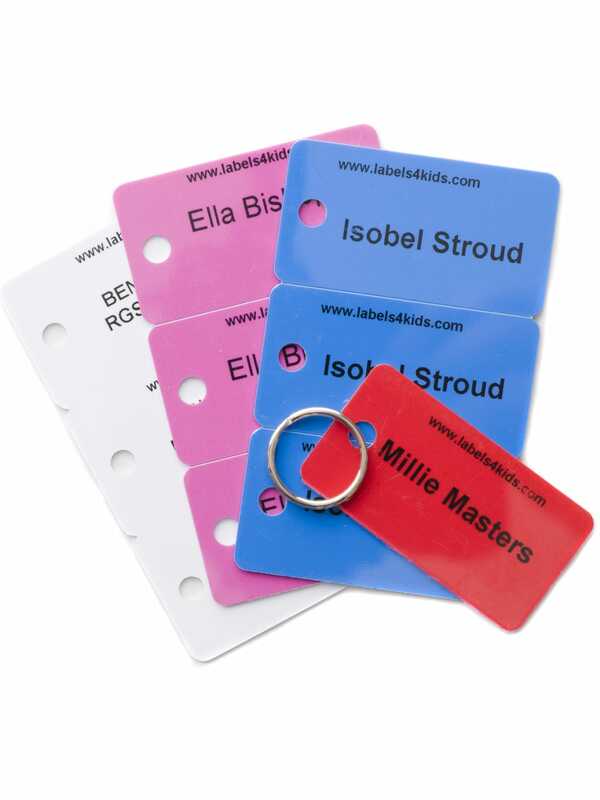 The plastic jacket tags will ensure your child’s name can be seen on their coat in no time. No more coats going home with the wrong child. Supplied with 20mm split key rings. Attach jacket tags directly to bags and coat zippers. Great for popping onto the Zip of coat, even popped one onto my little boys lunch bag. Have had a few of these. Had no issues. Neat and perfect for small bag tags too. Good quality, lasts the year. I have used them to label school bags and gym sacks instead of buying the bigger version. I am not sure they would with stand being pulled at several times a day on a zip of a coat. I like it . I attached one on the school bag. Nice name tags but overpriced. Ideal for coats & bags - I add my phone number so we should always get them back no matter where they are left. Ordered the jacket tags for the 1st time. They are and ideal size to be used as coat/jacket tags for younger children but I didn't use them as jacket tags for an older child - I used them to label the High School bag (less conspicuous than bigger bag tag ones which we've used before but probably... Read More. Ordered the jacket tags for the 1st time. They are and ideal size to be used as coat/jacket tags for younger children but I didn't use them as jacket tags for an older child - I used them to label the High School bag (less conspicuous than bigger bag tag ones which we've used before but probably best suited to primary school age - but also great). Also used them to identify smaller bag and cases for Insulin and related items. 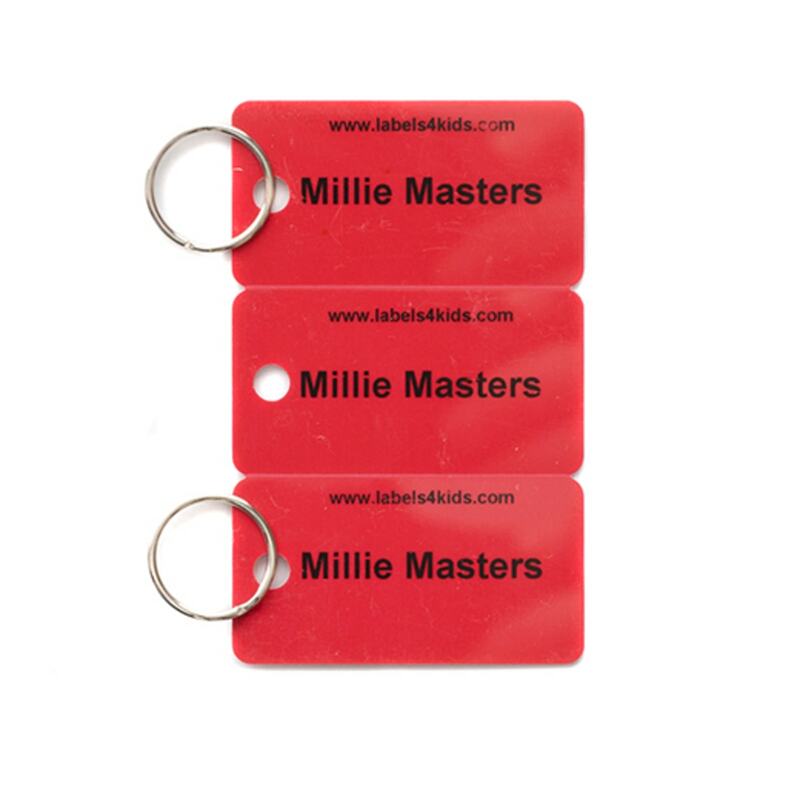 I ordered 2 sets - one with the school name, form and child's name on and the other their name but my mobile for contact in the event of loss or emergency. Ordered black writing on red background and information comes on both sides of tag. They come with metal key rings to attach. Only suggestion I would make to improve them is move the hole for the keyring in a little further - after regular use I can see them splitting - especially with all the pulling to open and close whether attached to coats or bags (as has happened with a couple of the bigger bag tags used previously - though if that happens, they can still be tucked in a pocket of the bag for easy ID). First class service - arrived extremely quickly despite the maximum time for order stated and really pleased with the tags. I ordered jacket name tags. I had my name and number printed on them in case my children got lost on a recent trip to Disneyland Paris. The tags were great. Well made and substantial. They didn't snap or bend and the print stayed on even though their shoes got wet. I would definitely... Read More. I ordered jacket name tags. I had my name and number printed on them in case my children got lost on a recent trip to Disneyland Paris. The tags were great. Well made and substantial. They didn't snap or bend and the print stayed on even though their shoes got wet. I would definitely recommend. Thank you for taking the time to write a review of your order - we value all customer comments. We are very pleased that you are happy with your Jacket Name Tags - so we are glad you found them to be hard-wearing. We hope to see you shopping with us in the future. Good quality product. Clear and durable. Great product bought before and reordered. Described as jacket tags but great smaller tags for lunch bags etc.